Alberto Vargas was a Peruvian immigrant who created graphic artwork for the Ziegfeld Follies as well as Hollywood Studios. Hi works are mainly done with watercolor and airbrush. It wasn't until his collaboration with Esquire magazine in the summer of 1940 by creating iconic World War II era pin-ups that he became a household name almost as famous as the beauties he captured. He fell in love with the all American girl and marveled at how self assured she was. He made sure to encapsulate this kind of determined quality in his work, a subtle difference from the ever popular but waning Gibson Girl of the previous generation. George Petty was actually the first pinup artist to be published in Esquire a few years earlier. The publishers grew weary of Petty's diva like success and wanted to replace him with Vargas' impressive artwork. Unfortunately, Vargas was not well versed in business and allowed the publishers to take over his contract. One small detail required Vargas to drop the 's' from his last name. The very first Varga Girl was seen in the Oct. 1940 issue. The accompanying copy read "Every once in a while a new girl is born, fully grown and partially clothed, like Venus fresh risen from the sea." 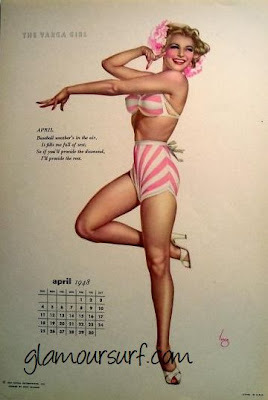 Shortly after came the Varga Girl calendar and the rest they say, is history.